We had a nice meeting in Arlington today with Seagull Lighting. Spencer Bolgard, their VP of Sales, was in town to accept their fifth Energy Star Sustained Excellence Award for their ongoing commitment to the development of energy efficient products. While he was in town, he met with all of our showroom managers, our purchasing manager, and our director of branch sales. The most exciting thing (in my opinion!) is they have quite a few new LED products, including several decorative fixtures. 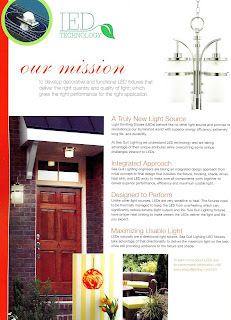 I'm showing one page here from their new Energy Efficient catalog, but let me know if you'd like to see what else they have. There are 6 mini-pendants and 2 exterior families, as well as cove lighting and a surface mount downlight. I haven't seen any of it in person yet, but our rep Shara Freeman hopes to have her sample kit in a few weeks, so we should get to see some of it soon!